Kodak ESP Office 2100 Ink Cartridges So, you want to save money on the costs to purchase your NEW Kodak ESP office 2100 ink cartridges but wish for the high-quality of prints they generate to remain...Well, it's a good thing you've arrived at InkNTonerUK as we offer just that!! 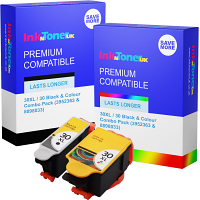 InkNTonerUK produce and vend nothing but TOP-QUALITY products and can assure to that the Kodak ESP office 2100 ink cartridges you'll obtain from us will be also be of the CHEAPEST and longest lasting around... Whether printing is a frequently used resource for yourself or you just simply print on the odd occasion (i.e. printing off monthly bills/bank statements) we are certain to have the exact product for you, with a choice of money-saving purchase options of all the essential Kodak ESP office 2100 ink cartridges that you need... Our CHEAPEST option is the standard-capacity 2100 ink cartridge producing around 335 pages per cartridge which is perfect for the less persistent printer user...You then have the choice of acquiring a high-capacity 2100 ink cartridge, traded at an increased fee to a slight extent, but generating a gainful 670 pages per cartridge. 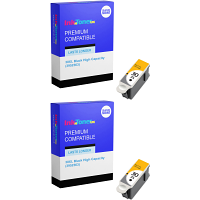 On the other hand, if you wish to spend less on the costs to get hold of both mono and colour Kodak ESP office 2100 ink cartridges then we have a inexpensively useful combo-pack on offer as well...We have just the right Kodak ESP office 2100 ink cartridge for every one! 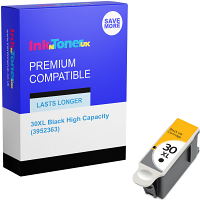 There is a guide line of standards in which we at InkNTonerUK feel is viable enough for sale, and we certify that ANY product we send out has met this. We solemnly declare that ALL our customers are awarded with optimum products, in this case with regards to your NEW Kodak ESP office 2100 ink cartridges. 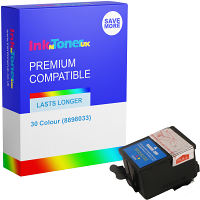 So, InkNTonerUK supply you with optimal quality, enduring & best off all low-priced Kodak ESP office 2100 ink cartridges around, so why wouldn't you obtain yours today!? Opt for the suitable acquirement option that best meets your needs, and before you know it, your NEW cost-effective and premium quality Kodak ESP office 2100 ink cartridges are on track, and at your front door!